Bradys Arva has been awarded Volkswagen Commercial Vehicles Dealer of the Year 2018 at the recent Volkswagen Gold Pin Awards. The award, which celebrates excellence within the Volkswagen Commercial Vehicles retail network, recognises the retailer’s contribution in a number of areas including sales performance, local market share and overall customer experience and is the highest honour that a Volkswagen Commercial Vehicles retailer can achieve. Pictured at the award presentation was (L-R), Padraig Brady, retailer principal, Bradys Arva Ltd. and Alan Bateson, Director, Volkswagen Commercial Vehicles Ireland. 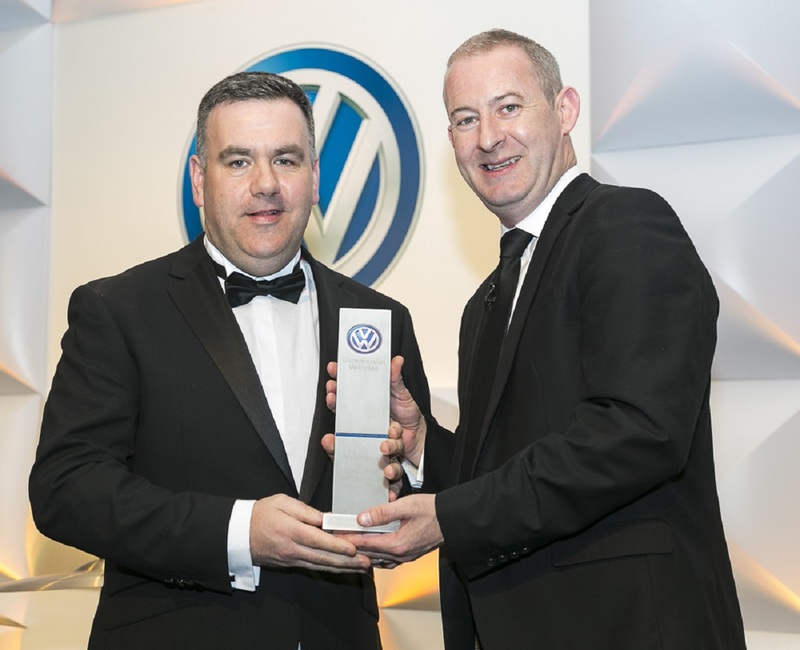 The award was presented to Padraig Brady retailer principal of Bradys Arva, by Alan Bateson, Managing Director of Volkswagen Commercial Vehicles Ireland, at a gala awards ceremony held in Powerscourt Hotel, Co. Wicklow. Commenting on the award, Padraig Brady said: “To win this award is a huge testament to both our staff and to our very loyal and expanding customer base who continue to support us with their custom year after year. They are the most important element of our business and we never try to lose sight of that. Congratulating the team at Bradys Arva, Volkswagen Commercial Vehicles Director Alan Bateson said: “This is a very well deserved accolade for Bradys Arva who deliver not only our award winning and best in market products but a service in sales and aftersales that ensures all customers are given the service they require. In 2018, Bradys Arva helped to deliver a 23 per cent market share, making Volkswagen Commercial Vehicles and Bradys Arva the number one choice in Cavan.